I'm sitting on the plane after a fantastic two days in Wellington at the 2010 NZSO/SOUNZ Readings. It seemed very relaxed this time around as the format was slightly different. Usually the pieces are purely workshopped and are often early on in their development. 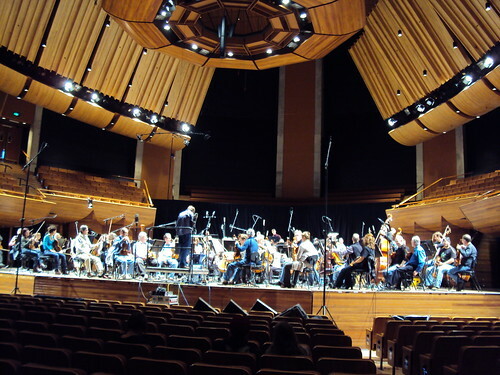 This time the pieces were chosen from previous NZSO/SOUNZ Readings to be recorded properly and then released. So it was a nice relaxed atmosphere with no nervous composers, or players for that matter. Also the fact that one piece had pulled out meant all of the other pieces got extra time, which made it even more stress-free. The pieces were a nice mix from Tom McLeod's epic film work, to Claire Cowan's very clever Legend of the Trojan Bird, to the heavier pieces by Gillian Whitehead and John Rimmer. All fantastic composers, so it was great to hear their recordings being created. My piece, Rakaia, went really well. I knew everything worked, so it was just a matter of getting a good solid recording. Well, what do you know? After rehearsing a few spots, they nailed it very early on. I was very pleased - it sounded incredible. You've got to wonder what these players, and conductor Luke Dollman, are made of, as the NZSO/Todd Young Composer Workshop was (rather ambitiously) scheduled in the two days before the SOUNZ workshop. All up, in four days they recorded fifteen pieces - pretty good effort and great to see so many New Zealand works getting workshopped and recorded. During the trip I managed to pop in and see the new SOUNZ office. They are now nicely situated just off Cuba Street and they've got a wonderful view of Wellington City. Also great to finally meet Julie Sperring, the new Executive Director of SOUNZ, who's going to be a superstar ambassador of New Zealand music. Hey everyone. Well last weekend Wendy and I headed down to Wellington for this year's readings with the NZSO. It started with a lovely weekend, we chilled, ate great food and experienced Wellington. Then it was Monday. I was first up in the morning session and so all the players were fresh and ready for anything. "Rakaia" is not too much of a challenging piece, although plenty of notes for the strings. First read through they did fantastically well. The huge brass and percussion sound was just fantastic. After working with Ken Young and clarifying a few things both he and I wanted to work on, they pulled it apart a little and started work. Was wonderful seeing them work on my music once again. This piece is very clearly written and is enjoyable for the players and this definitely show through the rehearsal. Later in the day was the recording session. After the long day this final run through and recording wasn't as tight as they had it earlier in the morning, but still a remarkable performance. I had wonderful feedback from the players. Complimenting the colourful textures, energy and effective writing. Also a comment about the likeliness of this piece to the music of Don Davis. A bit of a surprise, but came from a guy who used to play in Don Davis' scoring orchestra, so I gratefully took his word. The rest of the workshops were enjoyable. Was nice to get mine out of the way. Monday had a selection of other young composers which were shorter works. All very different and extremely well written. Tuesday had two longer works. Thanks heaps to SOUNZ and the NZSO for the wonderful two days. Photos ... ASO rehearsing Rakaia! Me giving a few final comments! Well well well. This afternoon was the premiere of "Rakaia" and it went very well. I wasn't playing in it so could really enjoy it. The percussion finally got it all together and sounding fantastic and the strings got (almost) all of their notes in. Everyone gets a little excited as it goes through ... including the conductor, so the tempo pushed a little but overall it was fantastic and had heaps of great feedback from the audience. 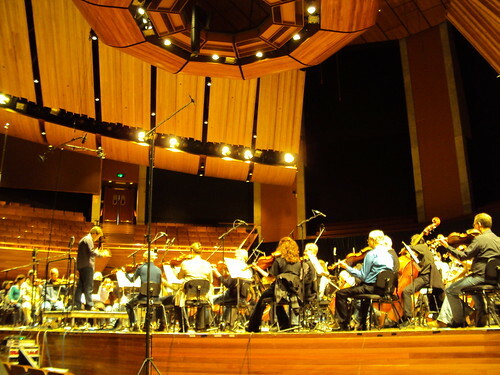 Above is a photo of Auckland Symphony during the premiere. By the way I just want to clarify ... it said in the programme that I won the 2006 Young Composer Award. This was in fact not the case, I was commended at these awards. I hope no one is mislead by this. Not sure who wrote my programme bio up. If any of those reading this went to the concert, I'd love to get your comments and feedback. Please send them through to me here. I'm looking forward to next week's concert at the Bruce Mason Centre. For details see the news. Okay so as per my last entry, yes we spent a good amount of time on "Rakaia" on Wednesday night. It was fantastic. Everyone finally got their head around it (... it seemed so anyway). I think many of the players are not familiar with this sort of music, so it has taken a while for things to sit naturally. Technically it is not too challenging but things just do not sit as you may expect as a player. Anyway after that rehearsal I went home a happy composer. Then ... today was the final rehearsal. We ran it twice and it was FANTASTIC!! I am so pleased with how it is sounding. I've been pretty pedantic about how I want it, and only today I felt that all of that paid off. Of course on concert day (tomorrow), it will rise to another notch so I can't wait. By the way, if any of the members of Auckland Symphony are reading this, then THANK YOU so much. It is sound fantastic and I know a lot of personal practice and perseverance has gone into it. Many many thanks. Stay tuned for how the premiere went. Hey all ... well just a quick note, we had first rehearsal of Rakaia on Monday night and it wasn't too bad at all. We mainly just ran through it a few times to introduce to the players, so (fingers crossed) this week they will go home and practice as next week we're pulling it to bits and REALLY rehearsing it. lol Musically everything worked very nicely, a few balance issues which we will fix next week. I'm waiting on a recording of this first rehearsal so will be good to have a listen of that too. Anyway will keep you posted.